I need to admit that since my failed run Wednesday where my quad killed, I've done nothing but eat! I decided to rest my leg and for some reason also decided that that meant I should stuff myself (quite literally)! 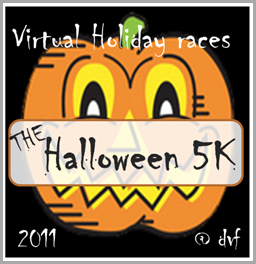 I saw today that one of the bloggers I follow, Kiley at Daily Vitamin F is having a virtual 5k tomorrow, and every other holiday coming up. I realized that tomorrow is the day I am going to get myself moving again! So, dark and early I will be up doing my Halloween 5K and all of you should too!! I don't promise I won't eat a ton of candy tomorrow too, I love candy and my mom always buys the good stuff!! But, I will work on getting my eating back on track starting today and remember that everything in moderation is a great motto!! Yesterday hubs and I had a great lazy evening! We watched Trick r Treat (one of the best Halloween movies EVER) and Killer Klowns From Outer Space (another classic!) and then we topped the evening off with Bravo's 13 Scarier Movie Moments and Iron Chef America's Halloween Challenge. All in all a great lazy night! Tonight we will probably watch another horror movie or two and then go to bed early so I can get up and run before work, I've been really lazy about that and need to get my runs in early so I don't find an excuse later in the day to skip! I had a lazy day yesterday AND today. It feels so good....Happy Almost Halloween! i'm starting to wonder if I can even run enough to account for all the snacky I've done this morning at work!